Before the Pyramid rose in response to the new-fangled pharaohs of the Mid-South, before B.B. and his blues bought back Beale, Raymond Robinson stoked the fire under his first slab in a small store at the corner of North Parkway and Manassas. Twenty five years later, Raymond’s passed on, but his smoke and his story still live. On a stool behind the counter sits Desiree, Raymond’s widow. The pendant dangling from the golden chain around her neck suggests simply TRY GOD. Her chin tilted toward the ceiling, her eyes far off behind her glasses. If she was looking out, she would see the dot matrix computer paper banner hanging over the entrance to the dining room. Nobody’s always right but Jesus But she’s looking in, remembering Raymond. “What was that he used to say?,” she asks herself, eyes still. 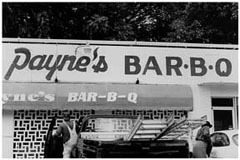 On this philosophy Raymond raised a business around his family and a family around his business, each so much a part of the other that trying to tell them apart would be as impossible as sucking the smoke out of a rib. Joe York: Ok. 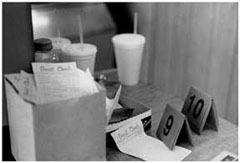 So this is the twentieth of September 2002 , we’re in the Cozy Corner Restaurant and I’m talking with Desiree Robinson. Well, let’s just start- We were just talking about when you cook the ribs and all that kind of- Like what time do you start and all that. You were telling me a story about how you cook in the morning. Can you just repeat that? Desiree Robinson (DR): Yes. I start cooking eightish in the morning and cook until five. I cook all day. And there’s- Of course, my son cooks some days, but most days I cook. 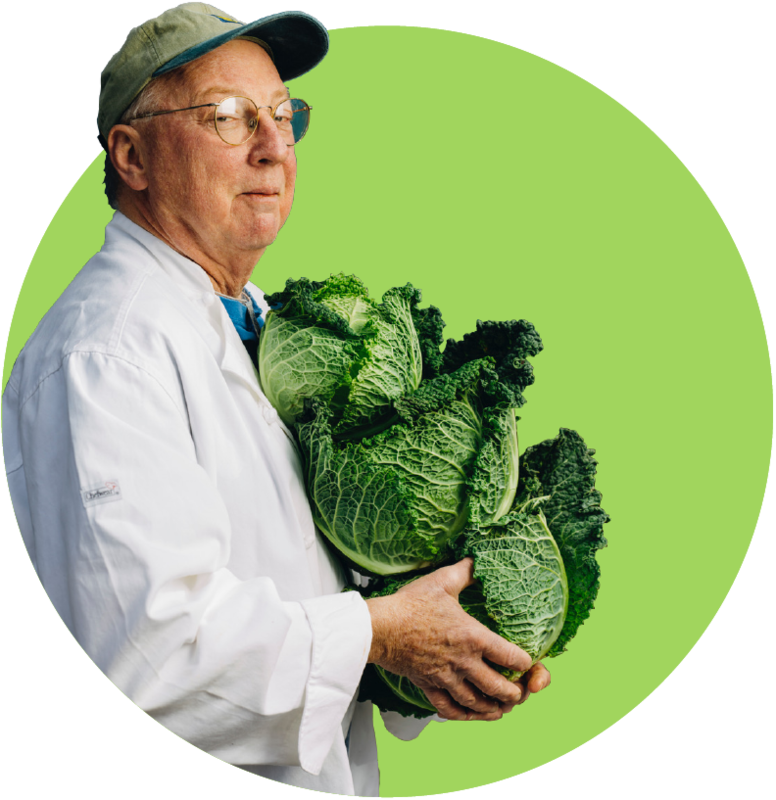 DR: When he was alive he cooked… He had a cook to come in from midnight until six and then another cook come in from six until the middle of the day, around noon . But I decided that I want that aroma in the nostrils of my customers. So, I cook from eight till five… eightish till five. When they come by in the morning on their way to work I want them to get the aroma that they will be plagued with until noon . [laughs]. And so your husband… What was his name? And he started Cozy Corner? 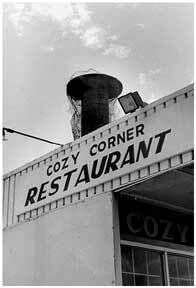 DR: In 1977, we started Cozy Corner. The actual… Actually it was the month that Elvis died, August of 1977. Twenty-five years we’ve been here. So this is your twenty-fifth anniversary. Start to tell me about these twenty-five years from beginning to end. 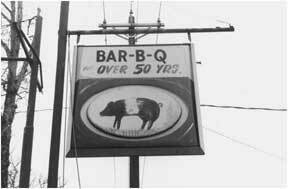 DR: Well, let me go back a little further than that because our barbecuing actually started in another city. When we got married we were living in another city. No, not exactly. He was living in another city and when we got married I moved there with him. And there was no barbecue there that was good. Now, they had barbecue, but it just wasn’t like the barbecue we were used to. So what we did was we formulated a recipe and began to do barbecue just for friends. 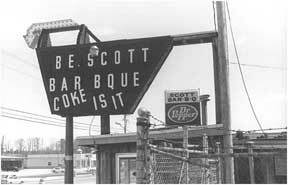 Eventually, we opened a barbecue restaurant there. DR: Yes. [laughs] And then we decided to come back to Memphis and that’s when we opened the Cozy Corner. Well, what took you out to Denver, if I could just ask? DR: My husband was living there. DR: Yes. He was working there, he was living there working. Do you mind saying what kind of job he was working? right now. But he was a salesman. So y’all came back here in ’77? DR: Yes. Yes. Yes. But, you’re probably wondering why did we come back to Memphis? DR: Well, initially we left… We decided when we got married that we would not live in Memphis for a while. He was an only child and so was I. [knowing pause]. Do I need to say more? Ok. So we decided that we would, you know, just not live here for a while. We stayed away about nine years and then we thought ‘It’s time to go back home.’ And I’m glad we did because since we did, you know, we’ve had problems with sick parents that we would have been going back and forth to see about. We’d have been right here. I have no sisters and brothers. He does have some step-sisters. DR: Let me tell you about it. We have a barbecue pit in our backyard that’s quite large. As a matter of fact, when we bought the house we wanted a pit, and if not, we were going to build one. But we saw this house with this pit and somebody said, ‘The only reason you bought this house was because it’s got a large pit.’ Well, that did have a little bit to do with it, but, you know, not much. My husband one day… You know, he was barbecuing for friends from time to time… One day I looked at that pit and he had nine Boston butts on it. I said to him, ‘You’ve got to open a restaurant. 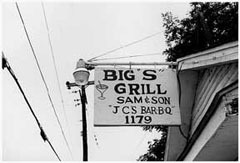 The neighbors are going to put us out of the neighborhood with all this cooking going on.’ So, when we opened this restaurant, we had an established clientele. The people who were coming to the house to get their barbecuing done, they began to come to the restaurant and invite their friends. And we’ve never done any advertising this twenty-five years. DR: It’s all been word-of-mouth and it’s done well for us. DR: No, no. Nobody ever brought anything. He selected the foods that we would prepare. 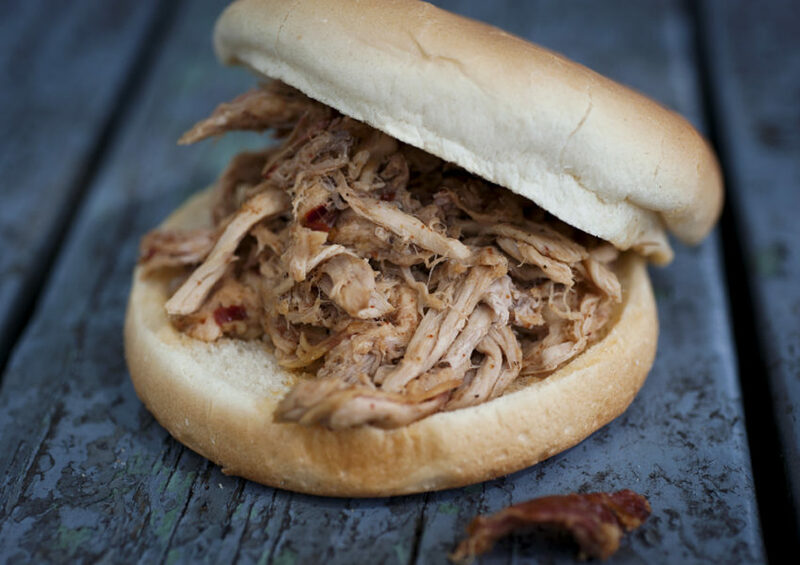 The Boston butts, that’s all we’ve ever done as far as the pork shoulder’s concerned. Boston butts. So, I think he did that nine for a fraternity. [laughs] And he would… Yes, he charged. He charged. And when they came for a party or for us to entertain them, NO. But when they placed an order and said they wanted to serve a party, then we would charge them, yes. He was working another job at the same time? DR: No, he worked as special agent for Illinois-Central Railroad for a while and he was a plant manager for Levin’s popcorn company and there was something… I know he did those… It’s been a long time. What were you working as at that point in time? DR: I worked for BellSouth for… As a matter of fact, I worked for BellSouth until 1991 and that’s when I retired. Has the store always been here since it started? Tell me a little bit about the place and any stories you remember from getting started? 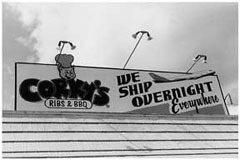 DR: Well, when we first got started we had a contract… or we got a contract with Memphis Queen… the river boat, Memphis Queen, and that brought a lot of, a lot of business into us because when people would go out on the boat for entertainment and eat our food, that brought us a lot of business. So, we’ve really been blessed because from the beginning we did have a bit of business. How do you… Just tell me something about the process of cooking the meat. Like what kind of fuel do you use? Is it always been charcoal? DR: I really don’t know because all people want to know from us is what do we use. And that’s all we use, is the charcoal. Well, do you have a specialty? DR: Here in the restaurant? [pause] Yes. It depends on the customer. Some people will tell you that the Cornish hen is the most outstanding item that we have. Others will say the ribs. Many would say the baloney. Others would say the smoked turkey. So, y’all just pretty much do everything. DR: Well, yes. We don’t have a whole lot of items on the menu, but those that we have, our customers like them. Well, let’s talk a little bit more about your husband. Just tell me about him. What kind of guy was he? DR: [laughs] He was a fun kind of a guy. Liked to have fun. Loved people. He loved people. Of course, we were married forty-two years when he died. We’d been married forty-two years. We met in high school. I’m not sure I was in high school when we met. He was. Has this been pretty much a family business from the beginning? DR: Yes, because when he opened the children would… Their high school was not too far away… they would walk from the high school over here to work. And then they went away to school, both of them, and when they came back, they came to work here. My daughter got married and had children, and the children were raised in that office right there. All three of them… Little babies, they were little stair steps. They would play on the floor and eventually they came out. When the oldest one was three, my husband sat her on a stool in front of the counter and told her what to say to the customers. ‘Your job,’ he told her, ‘is to say, ‘Thank you for coming and come back again.’ And for that her salary was twenty-five cents a week. [laughs] And, of course, it’s gone up a little bit since then because now they’re doing almost everything in the restaurant. The oldest is now nineteen in college and the other two are in high school, but if they were to come in here now, whatever needs to be done, they’d jump right to it, because they worked the entire time they were coming up in here. 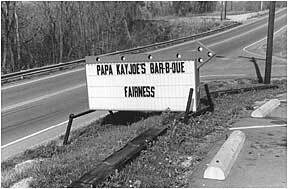 Do they pass the pit master job down through the family? DR: Well, my son does it. My son does it. My grandson has told me he’s interested. So, we’ll be teaching him, we’ll be teaching him. Yes, we plan to pass everything down. So there’s been a Robinson at the pits since this thing started? Well, do you have employees that are outside the family? DR: Yes. Many employees are outside the family. And there are some who barbecue, who actually barbecue on the pit. Not many. Do you have to select them very carefully? DR: Very, very carefully. Very carefully, because normally you want someone who can cook, BUT, a person who is a good cook, it’s very difficult for him to cook somebody else’s way. And that’s the big problem, getting them to do it our way. DR: Want them to be good, but, buckle down and do it our way. Tell me something about that. DR: Well, as of this moment I’ve not really had to train anybody. As I said, I was working on another job before, so I never actually worked in here until my husband died. Ok. That was about… what?… a year and a half ago. So, my grandson will probably be the first that I’ll train. And what I’ll do is I’ll have him watch me, I’ll have him ask me every question that comes to his mind, and then I will let him… Show him exactly what I do, tell him what I do, and then I’ll let him do it. Well… I’m not going to ask you how you do it because that’s your… But what’s the, kind of, the attitude that you take to cooking ribs? Is there a philosophy or an attitude behind it? DR: Simply that you’re in charge and you’re going to… You know, I’m cooking the ribs and I want the ribs to taste a certain way and be a certain way. Tender. Delicious. And you start from that angle and go on and do whatever’s necessary to get them that way. Is there anything you can tell me about how you do them that won’t give away you’re rib secrets? DR: Yeah. I don’t think so. DR: Oh, yes. The fifteen year old and the lady called and she said, ‘May I speak to a manager?’ Ok. That’s the story. DR: Ok. This is a fifteen year old whose name is India. She answered the phone and the customer… the lady called and said, ‘May I speak to a manager?’ India said, ‘Speaking.’ And she told her that she wanted to bring some material over for the manager to look at because she wanted to do business with us. And India said, ‘Just bring it to me. I’ll take it.’ The lady came in and brought a brown envelope with India’s name on it. India got it and read it and gave it to her mother and said, ‘This is some material you and Grandma might be interested in dealing with. Read it. I read it and I think it will work for us.’ [laughs] And it was a company that’s got employees who they want to hire out to us, and it looks like a good idea and we do plan to discuss it with those people. That’s great. So she’s ready to go. DR: She’s ready to go. She’s ready to go. Have you had members of the family who have just rebelled against the barbecue and said, ‘I don’t want to do this’? DR: There was a cousin who worked here for a long time… A cousin of my husband’s. And she was… She was excellent. She was kitchen manager. But she decided that she no longer wanted to do it and she went with… As a matter of fact, she went with the Peabody and she’s doing an excellent job there. Doing a wonderful job. And she comes in and hollers at us. And I think she just had enough, you know. It’s easy to get enough of, you know, certain things. Do you think you’ll ever get enough of doing barbecue? DR: No. I thoroughly enjoy this. I never imagined there was so much fun in working like this [laughs] as there is. So you’re relatively new at being here everyday. DR: I am. I am. Because my husband and my children ran the business until he died. I never worked in here. I was working on another job. When I retired… I retired and just kind of did volunteer stuff for several years and then when he died I thought ‘Well, let me go and be support to the children.’ And when I came in I began to just really enjoy it. And I never thought I would really cook, but I enjoy that. I enjoy meeting the customers everyday. I enjoy working with the children. I really enjoy being with them everyday. DR: Well, it took me… You’re right. Getting adjusted to not having him. Getting adjusted to getting out of the bed early again, because, remember, I’ve been retired for several years, but now it’s on a schedule again. I’m on a schedule again. So, I just missed him terribly, but I knew I had to go on. And a lot of prayer, by me and others praying for me helped me to make it through. Speaking of prayer, you wear a pendant around your neck that says ‘TRY GOD’, your business cards have ‘The wages of sin is Death’ and you flip it over and it says… What is it? DR: Eternal life is in Jesus Christ. DR: Nobody’s always right BUT Jesus. don’t see any aspect of anything religious or political or anything inside the restaurant, but yet y’all thrive with religious messages throughout the restaurant. So can you tell me a little bit about how your religion informs your approach to business and life? DR: The customers who respond to what they see, respond positively. I’m trying to think have I ever had a negative response… not that there may not have been some, but I never heard them. We are devout Christians. Plum fanatical. When we first opened that was put up there. We put that up there. As a matter of fact, at one point my husband and I had discussed putting scriptures around and we just never got to that. But I had made a list of the scriptures that we would do. And normally whenever I’m asked to autograph something I’ll autograph it with a scripture. DR: We’ve been here for twenty-five years. –on this corner. And in that time the Pyramid wasn’t here. Memphis kind of had a down time there for a while. But you guys have managed to thrive for twenty-five years and Memphis has been kind of up and down and all over the place. DR: It has to do with that aroma [laughs] because there’s a lot of traffic out here. A lot of it passes by us, you know, but, a lot of them stop. And many people downtown come for lunch and we’re basically a lunch business. Many come from downtown for lunch. Well, how have you seen this area around the corner change over the last twenty-five years? DR: Right today as we speak it is changing. In the last twenty-five years it has not changed. It’s been pretty much the same except the Pyramid came. You know, a few things came, but it’s basically, it’s basically been the same low socio-economic area in the city. Some things are being done now to really build it up, but we’ve had famous people come in repeatedly as you can see on the pictures around and we’ve got some pictures that we don’t even have out, we don’t have on the board yet. But people have come in. We’ve just been blessed. Do you have any stories about people who have come in? Anything particularly interesting? Val Bradley (VB): [Desiree’s daughter has just taken a seat next to her mother. She’s having a bowl of stew.] Glover. Danny Glover. DR: I didn’t say Glover. DR: — and told the cook… The morning cook was here. It was about five o’clock in the morning… . and said, ‘I’m landing in Memphis for about an hour at eight o’clock. 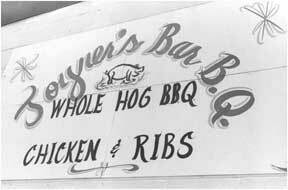 Would you have a slab of ribs there for me?’ And the cook called us at home and said, ‘Danny Glover wants ribs at the airport.’ And we said, ‘What did you tell him?’ He said I told him to call back.’ I said, ‘You did what?’ [laughs] But anyway, he got his ribs I assure you. And I thought that was interesting, you know, that he would want them. I know that y’all have a thing with Cybill Shepherd over there. She’s evidently a big fan. DR: Yes. 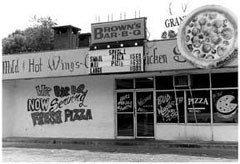 She has been wonderful to us from the very beginning because way back in the early ’80s she had… on the Tonight Show she was, and she identified Cozy Corner as her favorite eating place and nobody’d ever heard of Cozy Corner in Memphis, let alone anywhere else. Did you notice a pick-up in business after she said that? DR: Yes. Yes. Yes. Certainly. So you don’t have to advertise. You’ve got people to do it for you. Val, you’re here now. I’ll just introduce you for the tape. Your last name’s Robinson as well? VB and DR: No it’s Bradley. Ok. Well tell me… Because I know she’s probably not going to talk herself up too much… So tell me about your mom. You know, growing up here in the restaurant and learning the business… I guess just tell me a little bit about what kind of person your mom is. Brag on her if you want to. VB: Well, had it not been for her after Dad died Cozy Corner would have closed [pause] because I couldn’t have done it by myself. VB: She’s rescued it. She’s doing the cooking when cooks don’t show up. She’s just been the backbone. She’s been supportive, encouraging, wonderful. 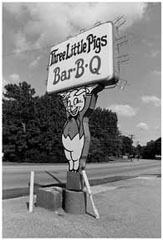 Tell me about growing up here with your father and growing up around the barbecue business. Anything you remember. VB: Well, growing up around my dad [pause] was a challenge. [Desiree laughs.] You don’t ever tell my dad that you don’t like something [pause] because even if you don’t like it the way it’s been served to you, try whatever it is you got because somebody may have done something different, and you may like it. DR: That’s something to eat. VB: And that’s about every kind of food. How old were you when they got started? VB: Started August of ’77. I was seventeen? Seventeen, yeah, because I was on my way to college. And where did you go to college? VB: Austin Peay State University. VB: Marketing. I got my degree in marketing. So you could come back here and work at the restaurant? Is that something that you had wanted to do? VB: I just wanted to do that. Wanted to keep the restaurant going. 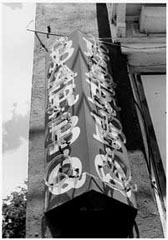 VB: In ’81, and I worked here and at the telephone company for a little while. And then I left the telephone company and came here full time. What are your duties here, now? DR: [laughs] That’s pretty… That’s pretty accurate. VB: Umm huh. They carefully tell me to watch the pit if they leave the pit, but they don’t [Desiree laughs] do that often because cooking’s not my forte. VB and DR: Keeping the books. VB: I take orders. I take care of inventory. And what were you doing when you came back from college? VB: I was doing mostly book work. DR: When he was alive that was what you were… basically taking care of the books. VB: Yeah, taking care of the books. Maybe, you know, taking orders and that kind of stuff. DR: Training employees and all of that. And now you’re married and have a family. Was your husband before you were divorced, was he ever involved here? Is that part of the reason why you divorced? VB: No, no, no. He’s was more interested in cars. He had his own auto repair shop. Do in-laws come into the business as well? DR: Her in-laws or mine? DR: One of the articles referred to her as ‘holding court.’ As the customers would come in, she would discuss things with them. And one customer told me, said, ‘She never forgets a thing. Two months ago I told her something. I walked through the door and she asked me about it.’ You know, so she was a vital part of the business. But she doesn’t feel like getting out anymore. VB: Yes. When they’re not in school, they work. VB: Nineteen, seventeen, and fifteen. DR: India. Yes. Avis is the oldest and she’s the one in college. BJ is a senior in high school, the boy, and India’s in the tenth grade? And, now, they’re involved. Do you think they’re going to continue to be involved in the business after they go to college and come back? VB: The oldest one is interested in education and the youngest one is interested in law and my son, music. So I don’t know. They’ll be able to if they want to because they know how to run it. VB: They can do everything in here, including cook. So they’ll be able to if they want to, but if they don’t, that’ll be alright. And this is the only Cozy Corner? DR: Yes. Now there was another one across over by Sears not far from here years ago. 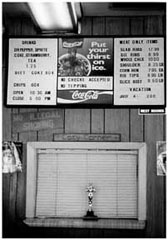 We opened one for two or three years called Cozy Corner Fish and Ribs. DR and VB: Yes. Fried fish and ribs. DR: That’s what was sold over there, but we didn’t keep it open long. VB: It was a little too much to do this one and that one. DR: Yea. And they were not big enough to do a lot and I was working. It was a lot on Daddy. You know, it was a lot on him. VB and DR: Yea. It is. It’s like ten states or something. So, I mean, obviously, people come in here, twenty-five years, successful with no advertising and all that… Why don’t y’all ever say ‘We’re going to branch out and be huge like Corky’s’ or be huge like some of these… Like Tops or whatever. VB: His thing was ‘I don’t want to serve everybody. I just want to serve a few people the best.’ If we can manage that then we’re doing pretty good. So you never got caught up in trying to take over the barbecue world? VB: Oh, no. It’s enough for everybody to have some. DR: Umm huh. That’s right. Do y’all have a lot of customer’s that have been here since the beginning? Twenty-five year customers? DR: You know… A lot of customers have come for years and do come… still come often. Does the relationship with those customers extend beyond these walls? VB: There’s really not that much life after these walls. DR: [laughs] That’s right… Not a whole lot, because we’re so tired, we go home and go to bed. But we have customers who have just become such good friends, and we have customers who have become my children. Somebody drove up the other day and Val said, ‘There comes your child… There comes one of your sons.’ And so they become sister and brother to my children and wonderful relationships have been established in this business. Customers come in and they look or feel stressed or distressed, I’ll address it and tell them to take care of themselves. VB: Kind of holding a little court yourself. DR: Oh, boy, do we have wide range of customers who come in and have us rolling on the floor, just laughing, just falling out laughing about various and sundry things. 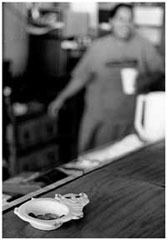 Customer came in one day and said… He began to say ‘Hello’ in various languages and then when he got to ‘Aloha’ he said, ‘Now that’s my favorite one saying ‘hello’ because ‘Aloha’ can mean ‘hello’ ‘goodbye’ ‘so long,’ it doesn’t make any difference, or whatever. So I thought that was… because then he began to ‘Aloha’– Everything that somebody said to him, he would respond with ‘Well, Aloha’ [Laughs] A-lo-HA, A-LO-ha. They, they… Customers are so interesting. There are so many stories that we have and it’s amazing that I can’t think of one [laughs]. VB: And when George Jefferson, I mean, not George Jefferson… Sherman Hemsley came in, he… You know the little dance that he did?… He did that in here. He did the little dance right in here? VB: All up front, he sure did. DR: Yes! Yes! He did. And the customers were amazed at how sweet and kind he was and generous with his talent he was. People would say, ‘Would you do this dance? Would you do that dance?’ And he’d go right into it. VB: We really haven’t had any celebrities in here that were not approachable. DR: Right. And that the customers just didn’t just love. VB: Umm huh. He stood right there and just ate. DR: — because that’s where Raymond would sit, at the pit, you know. VB: And Danny Glover just kind of walks around and eats. So they’ve all got different styles, the celebrities? DR: [laughing] The things that they do, uh huh… One day I came in and I had just come in from work, and greeted my husband, and there were three or four young men standing at the counter, and he said to me, ‘This is the… What kind of edition? The singing group [she asks Val] First Edition? VB: First Edition? New Edition? 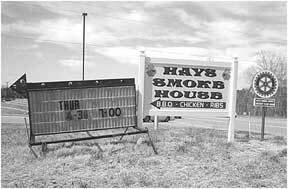 Well, did y’all have, you know, with the big fight, did any of the Tyson people or the Lewis people come in? DR: when he comes to town. And there was some celebrities in, but I did not know them because they had been on TV and one of the ladies had said that she had come to Cozy Kitchen and Go there [to the TV audience]. So, you know, we’re Cozy Corner. So, the next day she came in and introduced herself and said, ‘I want to apologize because on television I gave your restaurant as Cozy Kitchen.’ And I said, ‘Don’t worry because they got it right. They came here.’ Because we had an influx of customers as a result of that. Do people come from all over? Do you get people from different parts of the world and all that? VB: We get a lot of people from Australia, England… And I say that because I can recognize the accents. VB: I want to say Sweden, but that’s not what I’m trying to say. Norway, we’ve gotten quite a few. But Australia and England, a lot. DR: Customers would come in saying, ‘I saw you in Africa. I saw you on TV in Africa. I saw you, you know, in different countries’ and they would come in and that would be why they were here. That’s how the cross-the-waters customers got started. VB: Not all the time, but enough. Because y’all’ve been in some books, right? VB: The Stern’s were in here within the last three or four weeks. DR: Mike and Jane Stern. VB: Their first book, I think, was Eating Across America. That’s right. 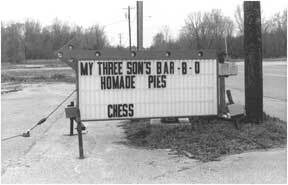 It had the big piece of pie on it? DR: Is Road Food. And they sent us a book and then they came in last week or a couple of weeks ago. And it was nice meeting them. We’ve been in a number of magazine articles, this year, and they’re up there on the counter. VB: Called Budget Travel? Or something like that. 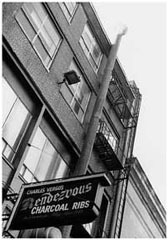 VB: It mentions us and Rendezvous? DR: in here, but that’s a typo. That’s not so. I wish you could get a slab for five dollars. DR: Now that’s not so. VB: I don’t think you can buy a raw one for five dollars. [pause] But we’re mentioned. And y’all do the dry rub here? And you make a sauce for the… You serve sandwiches, shoulder sandwiches? DR: Uh huh. We have a wet sauce. And what kind of sauce is it exactly? VB: It’s a sweet sauce. Was that a sauce that your husband came up with? VB and DR: The dry sauce? VB: Yeah, he kind of fiddled around and got that like he wanted it and she and he came up with the dry sauce that we cook everything in. So everything, rib, shoulder, gets the dry rub while it’s on the pits? DR: I’ll tell you. [pause] Salt and pepper. That’s big secrets around Memphis? DR: Yeah, that’s a family secret. For real, it is. 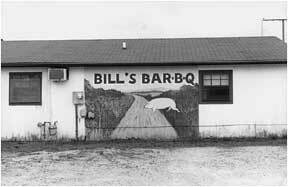 Well, what’s up with… See, I grew up in Alabama and everything is wet, everything… Y’all ever had Dreamland ribs? 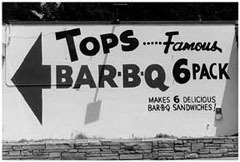 DR: My husband said… we went through there and ate some… he said those ribs are the closest to ours he’s ever tasted. DR: Where do you live? I live in Gadsden, Alabama. 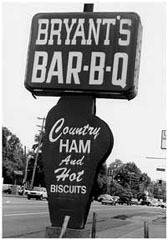 Y’all ever been… It’s about an hour northeast of Birmingham. Well, I went to school at Auburn, which is just up the road from Tuskeegee, so. DR: You cook it dry. VB: –and when you order it you tell us what kind you want on it, hot or mild. DR: And many of our customers never put the wet sauce on our ribs. DR: Just eat just like it is. DR: Rendezvous is the only one isn’t it? I think they’ve got one of each. VB: Yeah, I think they do because if I remember seeing a menu it was dry or wet… Ok, yeah. I really don’t know a lot about it. But do you know where that comes from? 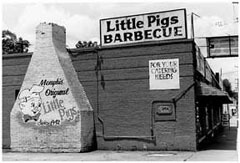 It seems like a lot of people serve them wet, here in Memphis there’s a lot of dry rub going around. DR: Ok, when we started… When we formulated the dry sauce we wanted… You know, we didn’t know about wet and dry. We wanted a product that you could take off the pit and eat because so many folk thought that a sauce made, a wet sauce, made the meat, and it shouldn’t, we thought. DR: The meat should make the meat. So we wanted a sauce, a dry sauce, that we could put on it… Just like you put salt and pepper on it. You put it on it to make it taste better. So a lot of things, when you put salt and pepper on it, you don’t put anything else on it. Except that you want it to have a different flavor. You want it to taste different. So we just went with it so we could have a meat that tastes good. Like when you put salt and pepper on a chicken and flour it and fry it, you can’t put anything else on it except that you want it to taste different, then you throw it in some gravy. VB: And their friends, too. DR: And their friends come to work. They’ve got buddies… Their buddies come over here and work. And that’s a good thing because my grandson… I told Val, I said, ‘Do all of his friends like to work?’ I said. ‘Because every time he gets a new friend, they come and go to… They just come in and go to work.’–‘What can I do Mrs. Robinson?… Come in and go to work and that’s just wonderful. And she’s some kind of a business woman, I tell you. She handles… Because, she’s got three teenagers. They are all live wires. They are all involved in everything. She’s handling their situations. She’s handling her business here. She’s active in her church. And she really takes care of Cozy Corner. Did he learn from his father or… Where did he learn to cook? Or did he teach his self? DR: Everybody I know… When I was coming up, if you weren’t a good cook, you were nobody. Your parents taught you to make… You had to learn how to make a full meal, have it on… When I was eight years old I was preparing meals for my family. Monday through Thursday that was my job. At five-fifteen a full meal had to be on the table with a dessert. Now that dessert… No, ‘with something sweet’ was what my mother would say. Now, that something sweet could be lemonade, but there had to be something sweet. And everybody I knew… You know, if you were fifteen and didn’t know how to make fried chicken and spaghetti and tuna salad and a few things like that, you were nobody. [laughs] It was a status thing, knowing how to cook. I can remember when I was quite small, my mother would go to her club meetings and her parties and I would bake the cookies and make the fancy cookies for her parties. Raymond’s mother… Raymond’s father was a chauffer for Abe Plow. And, of course, they did all kinds of partying and taking him… He liked, his father liked to cook and his mother did some cooking, too. He was a chauffer for whom? VB: Cosmetics. I want to say St. Joseph Aspirin. VB: They do medicines and that sort of good stuff. DR: Yea. 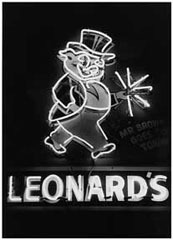 If you were a Memphian, you would know, but anyway. And so he [Raymond’s father] would make all kinds of dishes. So, Raymond got exposed to it that way. And we both were interested in foods. Does cooking the meat in a similar way to you cook it now, is that something you remember from an early time in your life? DR: There was barbecue done around my house, but it was with a round tub and a screen over it. 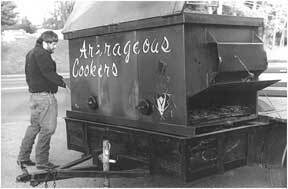 DR: Washtub with a screen over it and the charcoals put down in there and they would, and it would cook it, you know. So, yes, all kinds of foods and so forth that we did. Tell me about when you and Raymond met. DR: [laughs] Ok. You asked for it. We were quite young. I’m not sure, about fourteen, fifteenish. Ok. I went to this school grades one through twelve. Raymond came in the ninth grade [pause] to play football, and he met my next-door neighbor, who was a young man his age. They were both playing football. So he would come over and visit him. They would walk home after school and he would visit with, Joe Lee was his name. And so that’s how we began to notice each other. He would… Actually, for the first year after I met him we kind of harassed each other because he would call me on the phone and say, ‘Why does your boyfriend walk you home from school everyday? If I were your boyfriend, I wouldn’t walk you home everyday.’ Of course, when he became my boyfriend, he did. [laughs] And then we started dating after a while and dated for a couple of years, got engaged, stayed engaged for four years, and then we… Well, that’s because he went to the Service. He went to the Service. We were apart. So we decided not to get married until he got back. And he was in the… What branch? DR: Air Force. And then spent some years in Japan and when he came back home we married. And we were married, as I said, for forty-two years before he died? DR: His job was Clerk Typist. But he was kind of a big guy, wasn’t he? DR: Yes, but he was mean on the typewriter. [laughs] Yes, he was good. Yes. Was he always a big guy as long as you knew him? When he played football was he on defense? DR: He was tackle, and he was always a big guy. Now there’s a picture up there of him when he was in high school and he was big, not the kind of big he was, he was big but not fat like he was before, you know, before he died. 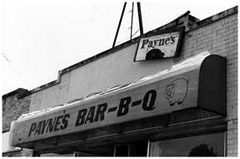 Now, do you know Mrs. Payne over at Original Payne’s. Is it Sandra Payne? Anyway. DR: Now, see my aunt was Joyce, Joyce, Joyce… And the lady you’re talking about… I can’t think of the name. But they were sisters and that’s how we’re related to them, by marriage. 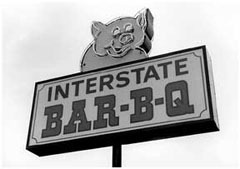 My question, and this may be completely unrelated, but going around and meeting, like, you, who is the widow of a barbecue pitmaster, and kind of having to come in and work in the restaurant, and then Mrs. Payne as well… Horton Payne who started Payne’s passed away a couple of years ago. And is that something that y’all notice. 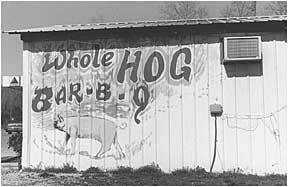 Is barbecue… Does it make a lot of widows? DR: [laughs] Looks like it, because as you mention this, I think about the Noel’s… The barbecue place Noel’s… He died some time ago, but she just died a few weeks or maybe as much as a month ago. So, I don’t know about that. Looks like it. DR: And the husband’s gone. The husband’s passed on and the wife is keeping it going. I mean, is it a particularly hard life, do you think? And, of course, having to wake up early. DR: Oh, yes. For me, for me that really was a change because I had gotten into sleeping until around nine or ten and then I would get up and do whatever activities I had lined out for that day. Are you glad you came back? DR: I’m glad. I enjoy it. I enjoy it thoroughly. I really enjoy, as I said before, working with my children, but I enjoy meeting and greeting the customers and getting to know them. It’s nice. It’s probably been a good source of strength. DR: It really has because I would hate to think that I would have just been sitting home, which I wouldn’t have. I would have done something. I did work with Habitat for Humanity when I first retired and Memphis Literacy Council. So, I would have gone back to some of that. But because they needed me here, I came and I’m glad I did. I didn’t ask you this and you don’t have to answer this, but how old are you? DR: I’m sixty-five and proud to tell you. DR: Yea. I was married forty-two years and I didn’t marry until I was twenty-one. You look great, You really look great. DR: I’m blessed, Thank you. I’m blessed. DR: That you might want to know? [pause] No. 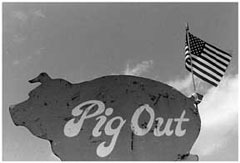 It doesn’t have to be about barbecue. Anything. Is there anything you want people to know when they read about Cozy Corner? DR: ‘Come on in. We’ll be glad to have you.’ [laughs] A lot of times I’ll say that. As a matter of fact, some ladies and a gentleman drove up a few weeks ago around nine o’ clock. Well, we don’t open until ten-thirty and the sign tells that we don’t open until ten-thirty. Well, they didn’t leave. They just stayed there and were getting out of the car. So I went to the door to tell them that we weren’t open. And the man said, ‘Please can we come in. We need to come in. The ladies need to use the restroom.’ And I said, ‘Come on in here.’ And then my son and I were having some appetizers. We did a Townhouse cracker, put some cheese on it, and put it on the pit, put some hot dogs, and cut them, you know, we smoked it first, and cut it and put it on top, and we were eating that. So they came in and we shared it with them and we just had a good time talking. That’s the kind of thing that I want people to feel comfortable and feel at home when they come. Even though we’re not really fast food, so it’ll take a little while for you to get your order… Because every order is fixed individually. We don’t have anything waiting around hot. When you order it is when we heat it. So I just want people to feel comfortable when they come in. I want them to know that they’re welcome and we’re glad to have them. And I usually try to make that known. And I told my employees, I said, ‘If they here a thousand Thank You’s it’s OK, but for them to leave out without hearing one is not OK at all.’ I said, ‘I’d like to hear a Thank You from the north, south, east, and west of this building when a customer leaves here. I want to hear Thank You’s all over the place. I want them not to know which way to turn their head and I want it to be sincere.’ So, we make it a point to do that. We don’t always get it done… I try to, to show them. Well, thanks a lot. This has been great. DR: Thank You. I wish you well.